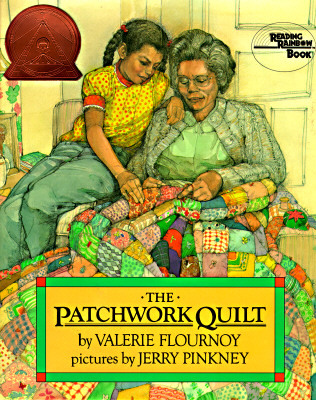 Twenty years ago Valerie Flournoy and Jerry Pinkney created a warmhearted intergenerational story that became an award-winning perennial. Since then children from all sorts of family situations and configurations continue to be drawn to its portrait of those bonds that create the fabric of family life. Jerry Pinkney is one of America’s most admired children’s book illustrators. He has won the Caldecott Medal and five Caldecott Honor Medals, five Coretta Scott King Awards, five New York Times Ten Best Illustrated Awards, the Society of Illustrators’ Original Art Show Lifetime Achievement Award, and many other prizes and honors. Recently a member of the National Council of the Arts and inducted into the American Academy of Arts and Sciences, he has also served on the U.S. Postal Service Citizens Stamp Advisory Committee. His artwork has been exhibited in galleries and museums throughout the country, including the Art Institute of Chicago, the Philadelphia Museum of Art, the Schomburg Center, and the Norman Rockwell Museum. Jerry Pinkney lives with his wife, author Gloria Jean Pinkney, in Westchester County, New York.